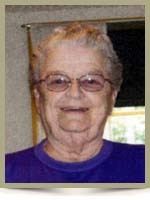 Mailman, Signa Violet “Iona’, 77, of Caledonia, Queens County, passed away on Saturday, April 21st, 2012, in the Queens General Hospital, Liverpool. Born in Bridgewater, she was a daughter of the late Hazel (Turner) Kempton. Iona loved spending many countless hours helping people with their family genealogy and she also enjoyed keeping records of her communities history, having been a former director of the North Queens Historical Society. She also enjoyed woodworking. She was predeceased by her loving husband Maurice and her stepfather Laurie Kempton. To the family of Iona,We were saddened to hear of Iona’s passing.She was a great lady to visit and talk to at great lengths about many subjects.She will surely be missed by those who were lucky enough to know her. Had not seen Iona in quite sometime but she was part of my childhood, our families visited back and forth often as Laurie and my mother were brother and sister. I do remember wearing some of her hand-me-downs to school . . . . . .
sorry to hear of Ionas passing,she is in a better place now.Knew her for years,her stepfather was my Uncle. Sincere sympathy to Iona’s family. She will be missed by me & my family as she visited twice a month to have her hair appointment for over 30yrs. Most any question could be answered by Iona concerning the history of North Queens. Sympathy to Iona’s family, I will always remember her stories, we shared alot of laughs, she always had so much history to share with me at the store, May you rest in peace now Iona.